Siddhartha Gautama, a prince born some twenty-five hundred years ago, is recognized as the Historical Buddha, or “Awakened One.” His enlightenment freed him from the cycle of rebirth, and his teachings became Buddhism’s foundation. The religion spread at a phenomenal pace. By 100 CE, missionaries had taken the Buddha’s teachings from his birthplace in South Asia to China. Within a few hundred years, Chinese Buddhist thinkers and translators were expanding the canon, also making it available to believers in Korea and Japan. Buddhism’s rapid evolution transformed China’s artistic landscape. 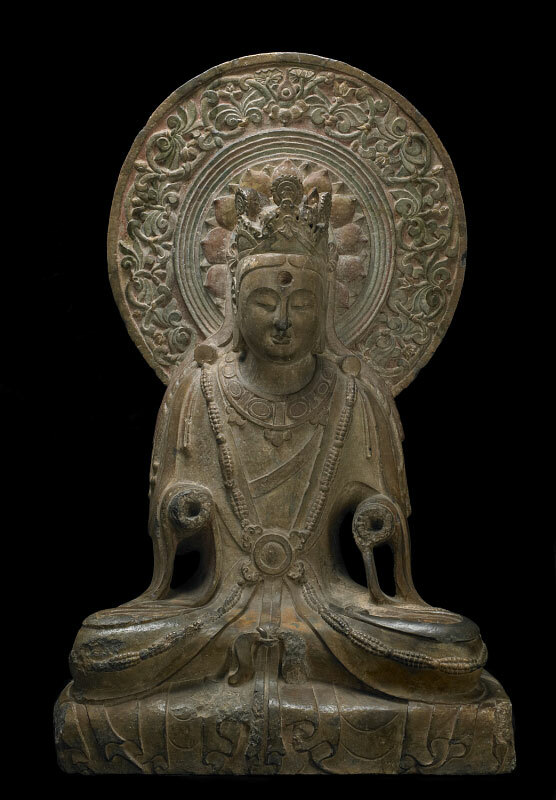 To modern eyes, Chinese Buddhist sculpture from the sixth through the eighth century is among the most appealing in the history of art. As explored in this gallery, the period produced massive cave sites, grand temples, and monumental stone figures, as well as smaller images for domestic altars. The buddhas, bodhisattvas, and disciples in this exhibition were made to inspire and guide believers on their spiritual path. Their beauty imparted the promise of paradise.